Instagram’s new video service has been live for about 2 weeks now, allowing users to post short 15 second clips to their profile. Instagram’s video has a number of features to better Vine (such as image stabilisation and video filters – not to mention the much larger audience) – and now Twitter are trying whatever they can to get new Vine users signing up. So Twitter are now email marketing to their users (who haven’t opted out of marketing emails, or already signed up to Vine) to try and bring the game to Instagram. The problem I see is that Vine worked ok for the Twitter/ Tech community – but kind of failed to get traction in a more general demographic (especially in Australia) – something Instagram didn’t have a problem with. I’ve also found Vine a rather slow app (when connected to fast Wifi), which just lead to frustration and consequently I stopped using it. 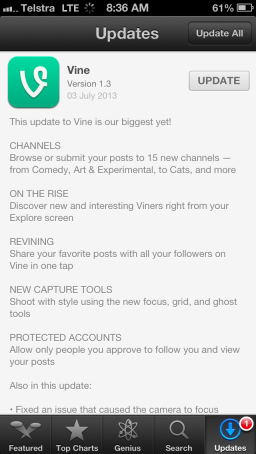 Earlier in the week we did see Vine release a fairly major update to plug some holes in functionality – probably one of the most requested features being the introduction of private/protected accounts and ‘revining’. 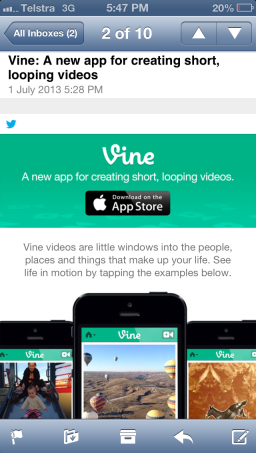 There is no doubt Twitter are pushing Vine hard, but is Instagram and Facebook just too big to battle with?